With refreshing sea breezes and the soothing sound of crashing waves, Camping Rügen is an idyllic spot for your next camping holiday. Situated close to Cape Arkona and its iconic lighthouse, this intimate camping site sits on a plateau overlooking the Baltic Sea. 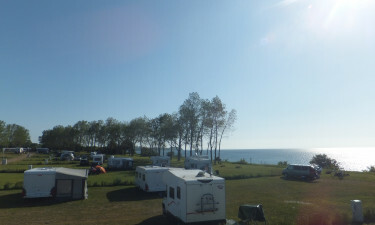 LuxCamp makes it easy to book your next camping holiday to Rügen. Situated in Altenkirchen, this luxury camping site is a gateway to Rügen’s renowned white limestone cliffs. The four-star campground also offers diverse recreational opportunities in a serene rural setting. High-quality pitches for your tent or a luxurious mobile home offer a comfortable space for you to enjoy a memorable camping holiday. You are treated panoramic views of the turquoise waters of the Baltic Sea. 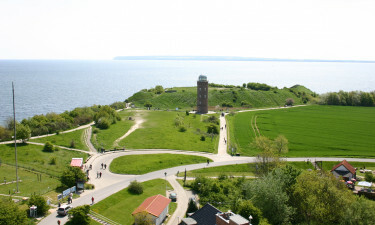 Hiking and cycling trails connect the luxury camping site to historic fishing villages and fortifications. 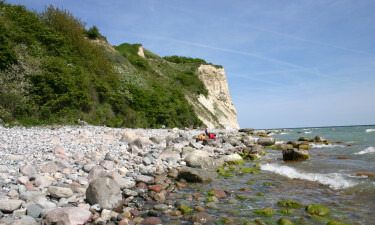 Camping Rügen sits above Die Schaabe, a quiet beach stretching 12 kilometres along the Baltic Sea. Steps from the campground provide direct access to the beach. The waters off this holiday camping destination are popular for sailing, fishing, surfing, and diving. After a day of exploring, enjoy a delicious meal at the restaurant or unwind with a drink on the terrace as the sun sets. A sauna and whirlpool provide you with other tantalising options to relax at this friendly holiday camping site. The campground’s other convenient perks including modern sanitary facilities, washing machines and Wi-Fi access.